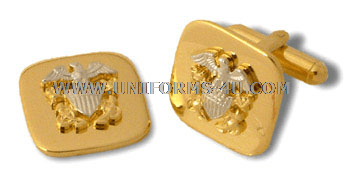 Worn by male and female Officers and Chief Warrant Officers with the Service Dress and Dinner Dress uniforms, these gold cuff links are engraved with the Navy’s Officer Insignia, sometimes referred to as the Officer Crest. 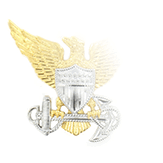 It consists of two fouled anchors, crossed diagonally, underneath a silver shield that is surmounted by a silver eagle facing to the wearer’s right with wings outspread. 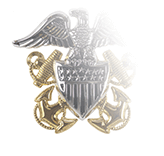 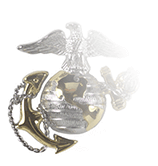 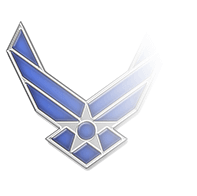 This same insignia also serves as a cap device on both Combination and Garrison Caps. 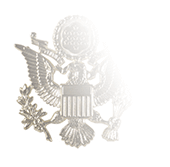 As attractive as these cuff links are, do be aware they are not suitable for wear with the Formal Dress (White Tie) uniform, which require the wearing of mother-of-pearl cuff links and studs.